If you installed a Samsung Touchscreen LCD device after the end of 2013, the power for the Slot PC and Touchscreen are now integrated. To save time and power, you can setup an automated system to reboot your device. Note – This will need to be completed onsite with the Samsung remote. 1. Go to Menu –> System –> Time. Set the display internal clock to the accurate date and time of your current location. 2. Go to Menu –> System –> Time –> On Time. 3. Select the days to reboot. Select Once, Everyday, Mon~Fri, Mon~Sat, Sat~Sun or Manual. 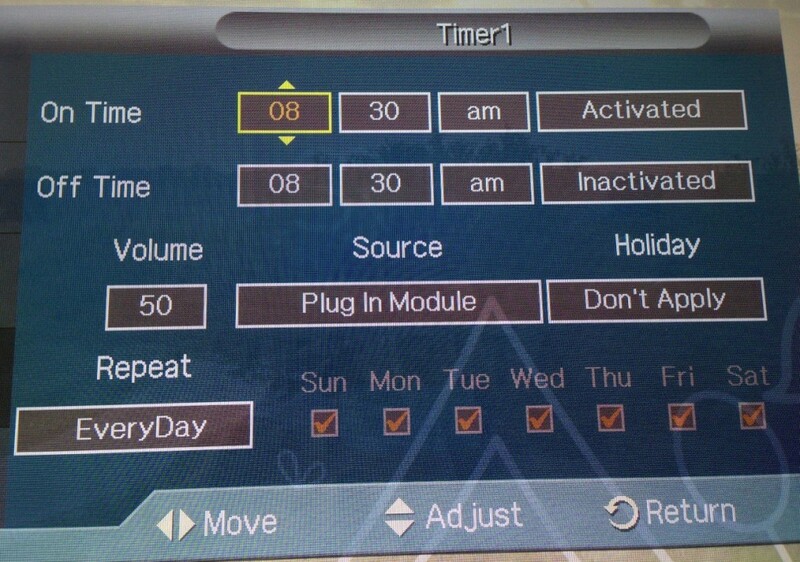 If you select Manual, you can choose the days you want On Timer to turn on your product. The check mark indicates days you’ve selected. 4. Set the hour and minute. Use the number buttons or the up and down arrow keys to enter numbers. Use the left and right arrow buttons to change entry fields. We suggest turning on the device 1 -2 hours prior to the opening of your location.